According to the understanding of the Traditions the idea of “symbol” refers to a sensible entity that directs the understanding from the physical towards the supra-physical levels of reality.’2 This understanding has been treated variously to different levels of intricacy throughout the writings of the sophia perennis. The current paper attempts nothing more than the organisation and reiteration of these various elucidations within the context of a defined whole. The adequate or sacred symbol is deemed to have been “given”; it is revealed to the tradition from a non-human source.27 Note that ‘adequation is not equality’,28 which is to recall that ‘participation is not identity.’ The adequate symbol is ‘true, analogical, accurate, canonical, hieratic, anagogic and arche-typal.’29 The hierarchy of adequacy, so to speak, does not necessarily imply that any one symbol is more “perfect” than another, for each will be perfect in respect to its own function. Paul Tillich observes that, ‘Every symbol has a special function which is just it and cannot be replaced by more or less adequate symbols.’30 Lama Govinda remarks, ‘it is the nature of a symbol to be as manifold as the life from which it grew, and yet to retain its character, its organic unity within the diversity of its aspects.’31 Again this highlights that, unlike signs, symbols are not arbitrary. This enrichment of meanings, which is “inward looking” and unifying, should not be confused with an empirical or quantitative awareness of a multiple of corresponding symbols, which, by itself, is “outward looking” and indefinite. The meaning of any symbol is integral with that symbol; the corresponding symbols act as “reinforcements.” Each analogous symbol is just that, which is to say that they are analogous but not identical for this would mean that they were in fact not separate but the same symbol. At the same time the “network of homologous symbols”, as Snodgrass calls it, does itself reveal the essential principle of Unity in diversity.39 The enrichment of a symbol through its correspondences is achieved by both reinforcement and by the revealing of the particular symbol in the unified network of homologies. Each of these lead back to an understanding of the Principle, of which they are respectively reflections on their particular levels. Syncretism consists in assembling from the outside a number of more or less incongruous elements which, when regarded, can never be truly unified; in short, it is a kind of eclecticism, with all the fragmentariness and incoherence that this always implies. Syncretism, then, is something purely outward and superficial; the elements taken from every quarter and put together in this way can never amount to anything more than borrowings that are incapable of being effectively integrated into a doctrine worthy of the name. To summarise: The symbol is the vehicle directing the understanding from the physical towards the supra-physical levels of reality; from the human to the Divine. The symbol has as its referent the realm of metaphysical Forms. The symbol participates in its referent. The symbol is multivalent having a multiplicity of meanings that do not diminish but instead enrich each other. The horizontal valence of the symbol is indefinite; the vertical valence is infinite. The symbol interconnects with its homologues creating a mutually reinforcing web of meaning. The symbol operates analogically and anagogically in both horizontal and vertical valences. The symbol operates according to the laws of analogy: “parallel” analogy, in respect of content; and “inverse” analogy, in respect of relationship. Symbolism operates through complementary modes: myth, ritual and doctrine. In respect to expression in diversity the symbol may not be reduced to a single fundamental meaning. The symbol is open. In respect to its metaphysical archetype the symbol expresses Principial Unity. The symbol is revealed and adequate. It is exact, having none of the arbitrariness of a sign. The symbol is essential and effective. It is nonetheless contingent on its need and in respect to the Absolute. The symbol effects re-memberance. It is the language that connects the Divine and the human. 4 See Snodgrass, The Symbolism of the Stupa, 1985, p.3. 5 The term “archetype” refers to The Archetype: Principial Being. This point is noted to avoid confusion of this term with the lesser “archetypes” of Jungian psychological theory. 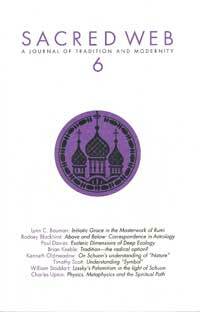 6 See Snodgrass, Architecture, Time and Eternity Vol.1, 1990, Ch.2, pp.8-9. 15 As quoted by Snodgrass, Architecture, Time and Eternity Vol.1, 1990, p.44, following Roszak, Where the Waste Land Ends, 1972. 19 See Smith, ’Objectivity and the Humane Sciences’ in Oxtoby (ed. ), Religious Diversity: Essays by Wilfred Cantwell Smith, Harper &Row, New York, 1976. 25 Snodgrass, Architecture, Time and Eternity Vol.1, 1990, pp.49. 29 Snodgrass, Architecture, Time and Eternity Vol.1, 1990, pp.49, following Livingstone, The Traditional Theory of Literature, 1962. 40 On the “geometry” of Being see Guénon, The Symbolism of the Cross, 1975, Chs.XI & XII. 42 See Guénon, The Symbolism of the Cross, 1975, p.58, as discussing a horizontal plane of Existence. 44 Snodgrass, The Symbolism of the Stupa, 1985, p.6. Titus Burckhardt remarks, ‘To carry out a rite is not only to enact a symbol but also to participate, even if only virtually, in a certain mode of being, a mode which has an extra-human and universal extension’ (An Introduction to Sufi Doctrine, 1976, p.99). Again, Martin Lings says, ’The symbolism of a rite is its very essence, without which it would lose its ritual quality.’ (A Sufi Saint of the Twentieth Century, 1971, p.177). 46 Snodgrass, The Symbolism of the Stupa, 1985, p.7. 56 56. Nasr, Knowledge and the Sacred, 1981, p.197. 59 Schuon, Treasures of Buddhism, 1993, p.84, n.2; Spiritual Perspectives and Human Facts, 1987, p.106, n.1; Language of the Self, 1999, pp.35-6, where he refers to “direct” and “inverse” analogy.